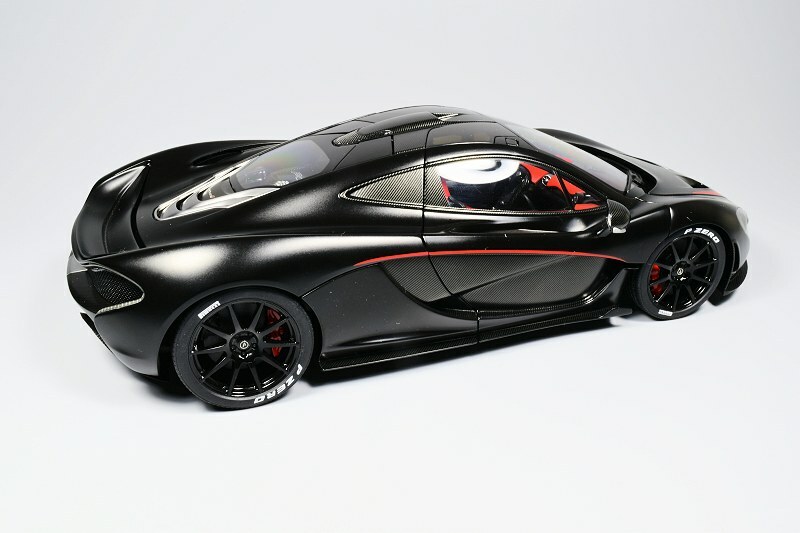 One of AUTOart’s most anticipated models in recent times is the 1:18 McLaren P1. There is an assortment of colours coming, the first of which is the Matt Black with Red accents. We have that model here today for review. 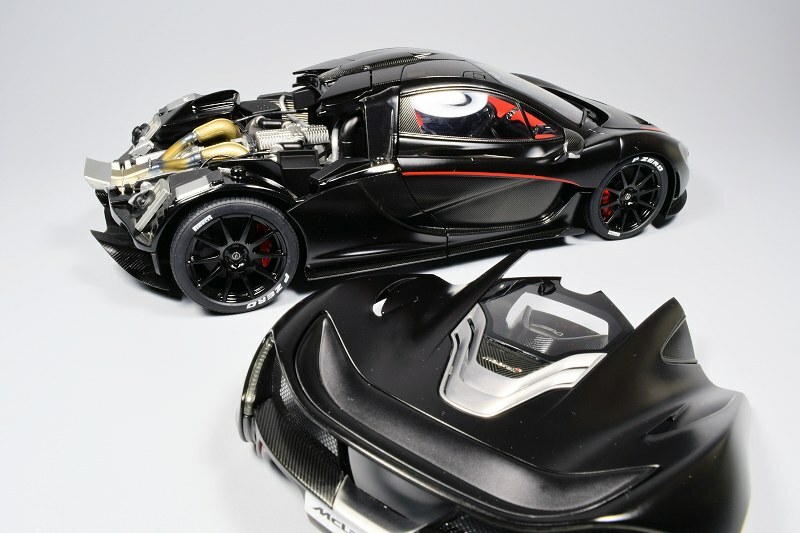 The McLaren P1 is a sportscar or hypercar; whatever it is, it is capable of speeds in excess of 218 mph or 351 km/h. 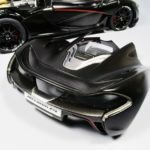 I won’t bore you with the details, as there are many resources to entail the granular technical side of the P1; in a nutshell, the P1 utilizes Hybrid Power and Formula 1 technology. 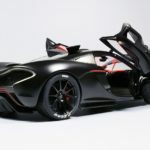 The car is like nothing we’ve seen before, perhaps a possible successor to the famous McLaren F1. The exterior lines of the P1 are just stunning; the car is pushing the boundaries of design as well as keeping the essence of the sports car alive. 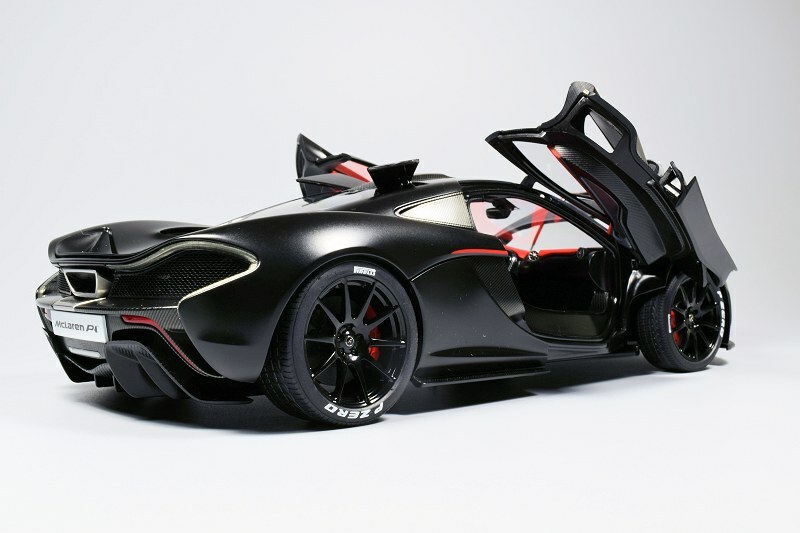 The P1 concept isn’t everyone’s cup of tea, but we don’t like those haters anyway (LOL). 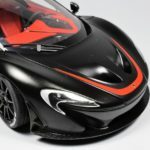 AUTOart did a great job at capturing the overall beauty of the P1’s lines. Initially I wasn’t sold on the Matt Black exterior, but spending a little time with her did change my opinion, and she photographs oh so well! 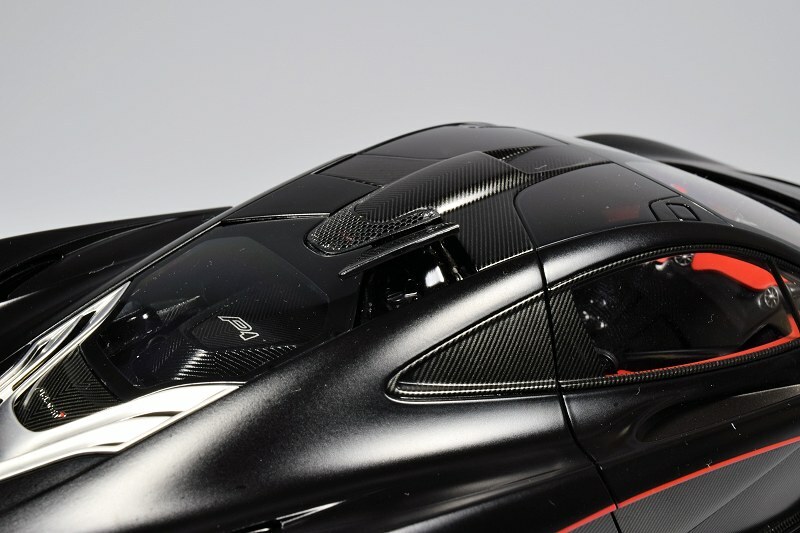 Exterior paint along side the carbon fibre craftsmanship is excellent. The Red accent bits work well in mating the exterior with the interior. I love the stance too, very aggressive, as all sports cars should be. The roof area features flaps left and right. Function of each is flawless. 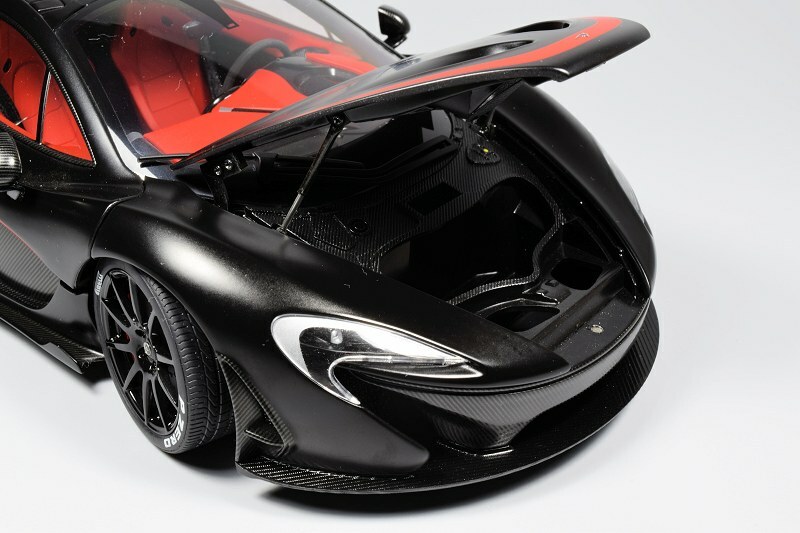 The front of the P1 features carbon fibre detail, mesh grilles and access to the storage. All elements are created with care, fit and finish is spot on. There has been some debate on the headlights, in my opinion the detail is there, but based on the price point a little more definition would have been appreciated. Rear is much like the front, great execution throughout. 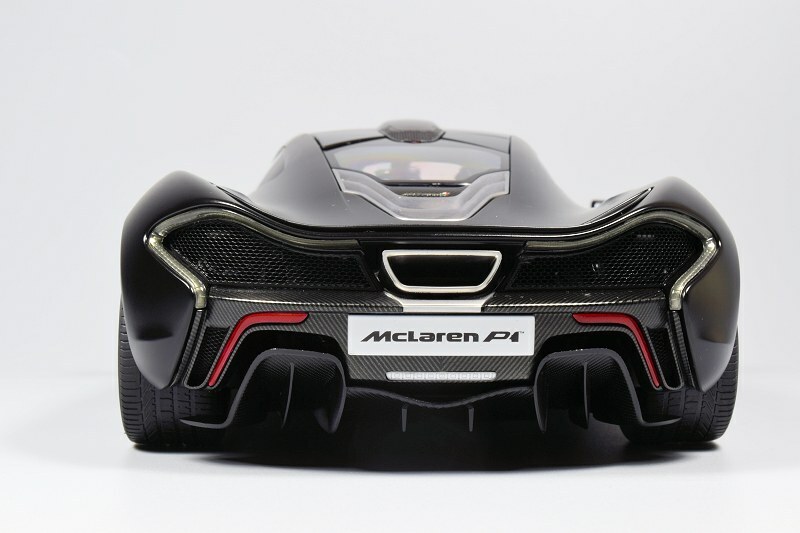 AUTOart even captured the minute workings of the rear brake lighting. 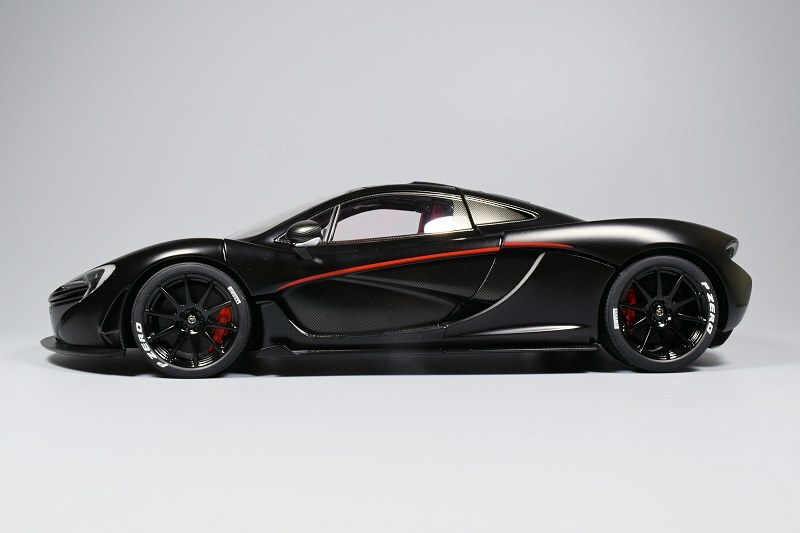 The P1’s wheels are sharp and executed in typical AUTOart fashion. I personally love the white script on the wheels. Basically it screams DON’T MESS WITH ME! 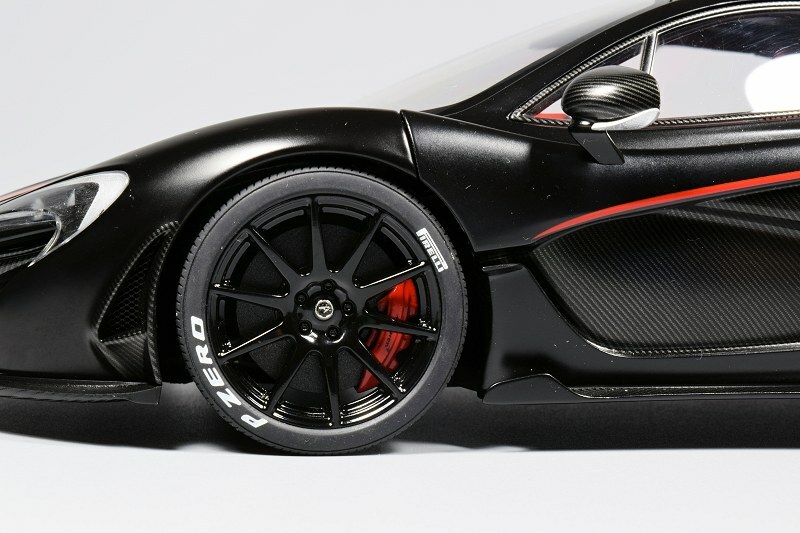 The braking components add to the realism with Red calipers and ceramic discs. 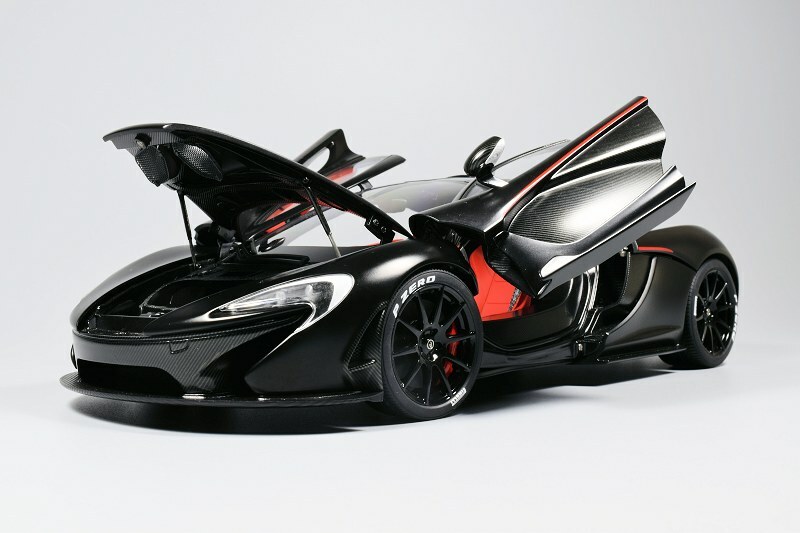 The P1 features a 3.8-litre twin-turbocharged V8 petrol engine. 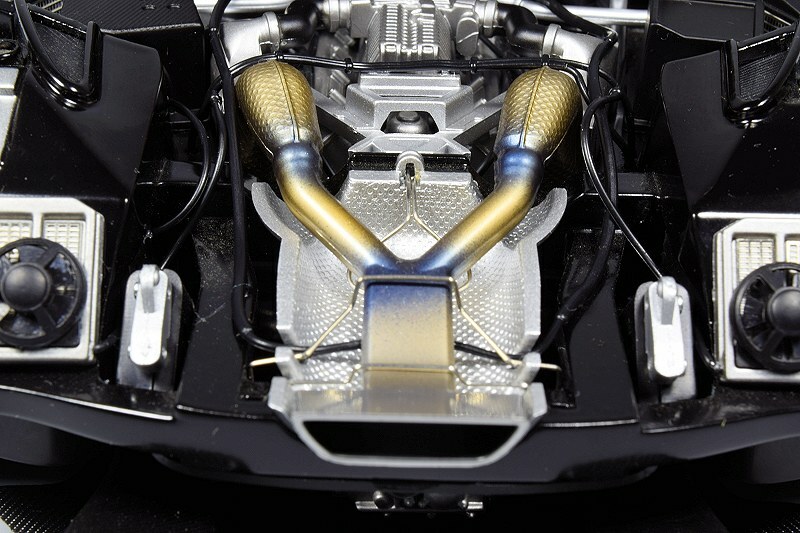 The twin turbos produce 727 bhp and 531 lb·ft of torque. Remember the car is hybrid; the in-house electric motor develops an additional 177 bhp. 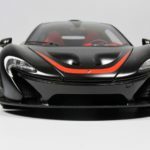 All this sounds delicious, and one would expect the P1 engine detail to be on par; well, folks, it is not. Your initial thoughts are wow, but the dust settles very quickly under closer inspection. 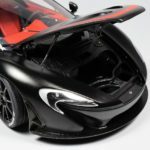 Based on comparing photos of the 1:1, the engine falls short. With a $300+ price tag the model ships with a $150 priced motor. A little more effort here could have gone a long way. 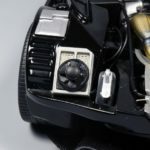 For example the radiators and cooling fans look like something I recently assembled on a LEGO Volkswagen T1 camper build. And based on the model’s repeated delays, I believe we collectors deserved a whole lot more for our patience. 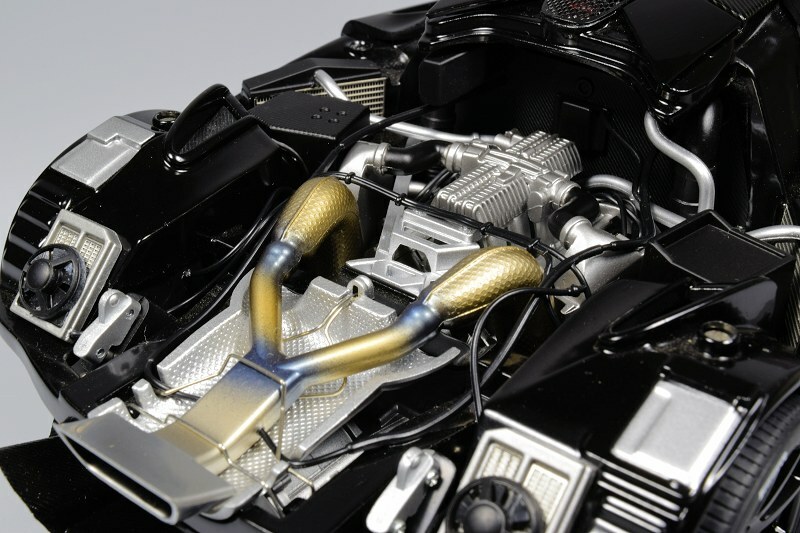 AUTOart was already behind the gun with the switch to composite from metal, so winning the hearts of fans would rely heavily on capturing the best possible detail. Well AUTOart you missed this race. It’s not all doom and gloom, though. On the positive side, the rear hatch is easily removed and installed, though it does seem extremely fragile due to the composite material. Also the paint work on the exhaust system is very cool along side the heat-shield, both add realism to the otherwise lacklustre engine bay. 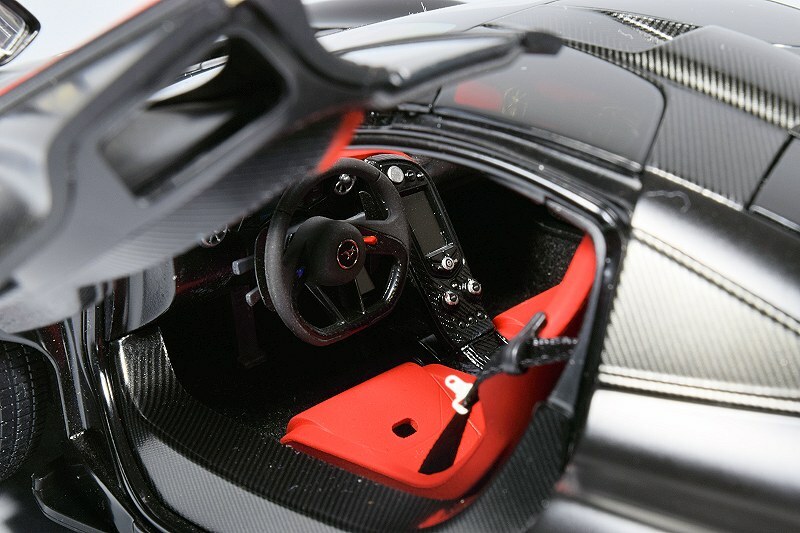 Access to the interior is done through the traditional McLaren up-swept doors. Function is flawless here. 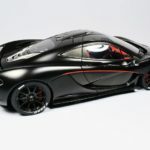 AUTOart seem to have captured the design well and profile lines too. There are no shock absorbers or struts in view, which mirrors the 1:1. Inside the cockpit all elements are there and crafted with care. Red on Black is very satisfying. Carpeting and fabric seat-belts are present too. It isn’t AUTOart’s best work, but I grade it A minus. 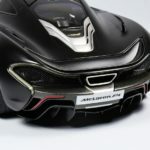 The McLaren P1 is a unique monster for sure. 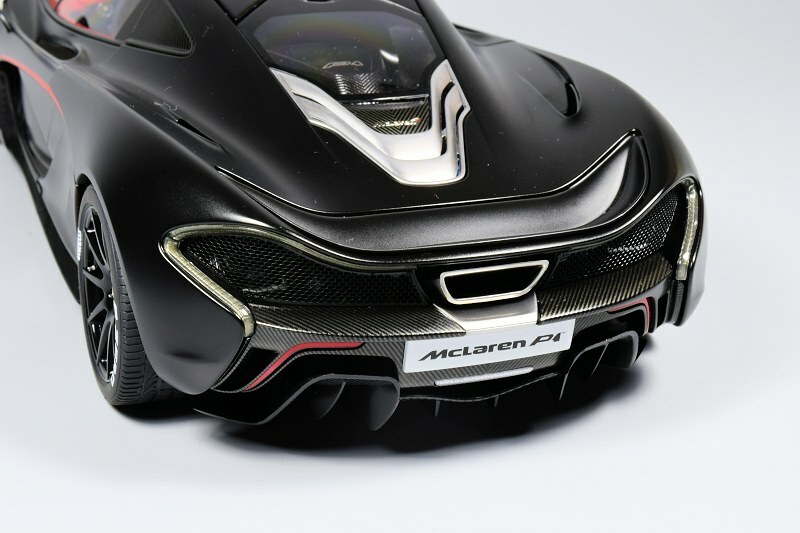 Overall AUTOart has done a respectable job with the P1. No doubt the biggest miss is the engine detail. I’m puzzled on who or how this final product gets approval through the AUTOart brass. That being said there are other options in scale, resin, though they are sealed. 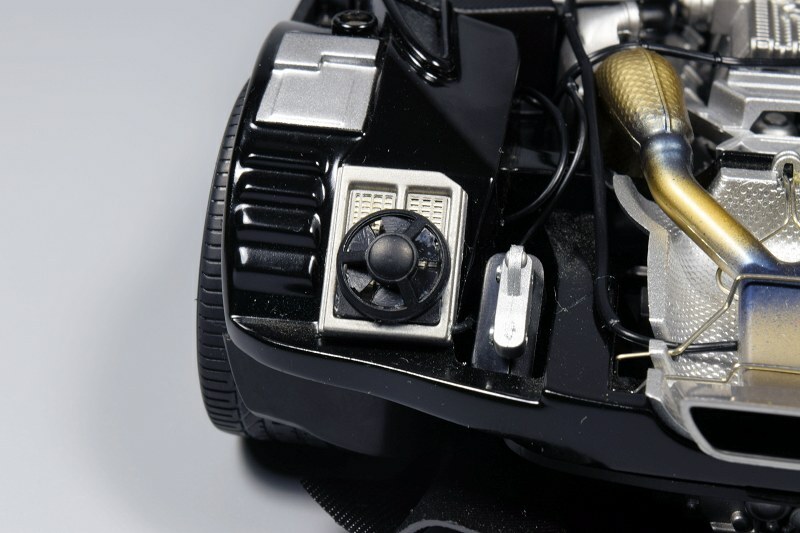 There is also the TrueScale Miniature option, but they don’t provide access to the engine at all. 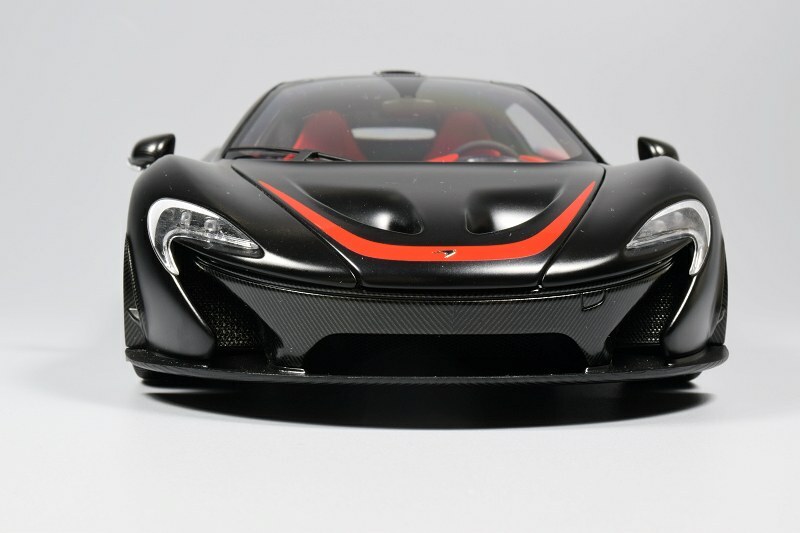 The AUTOart P1 is most likely the best dollar for dollar scale model available, BUT it falls short of the brand’s original identity. It really seems they don’t know where to play, be it high-end, low-end, mid-range, or what not, or is this a simple case of margin before execution? You decide. Enjoy the pics! 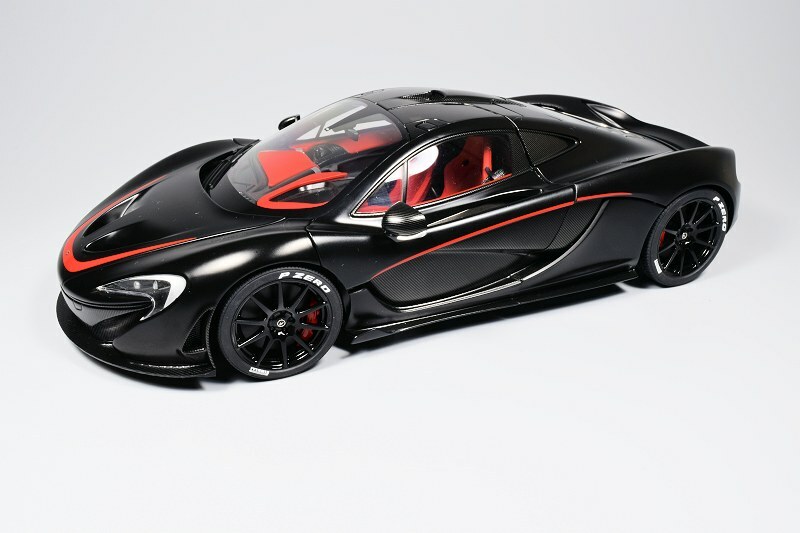 13 Responses to "REVIEW: AUTOart McLaren P1"
I wouldn’t spend money on that. That engine ruins it. It looks like they took two or three really big molded pieces and piled them on top of each other. What a disappointment. 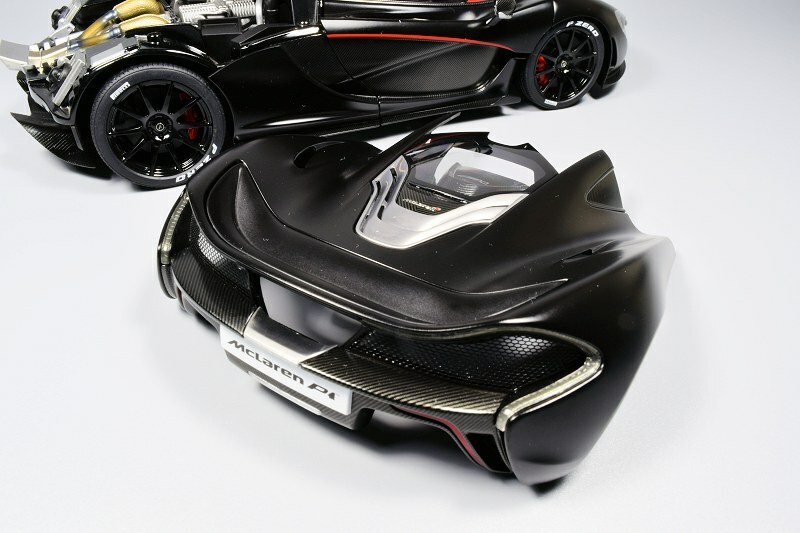 After seeing pictures of their Regera I’m thinking Frontiart’s version of the P1 is going to be Amalgam quality in 1/18 scale with a price to match, I also think FA’s paint options and engine detail are going to blow the AA version out of the water. The production model is supposed to be done by sometime in September. I am looking forward to how it turns out. Thanks for this well written review. Any chance you will do a review of the TSM Amethyst Black P1? Thank you. Problem with Fronti-Art is that they are priced way beyond the means for the average collector – appealing to 10% of the available audience. Unless TSM sends us one, most likely not. That’s a valid point and I wish their P1 wasn’t so expensive. I’m going to get the FA version, just don’t know what color yet. Send me the DS address in an email and I can ship it to you for a review. Same for the TSM P1 if I get that. 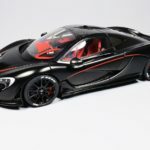 FA will make the 1:18 P1? I haven’t hear any news. A huge miss for Autoart on the interior because if you look closely, the dashboard is completely plastic. 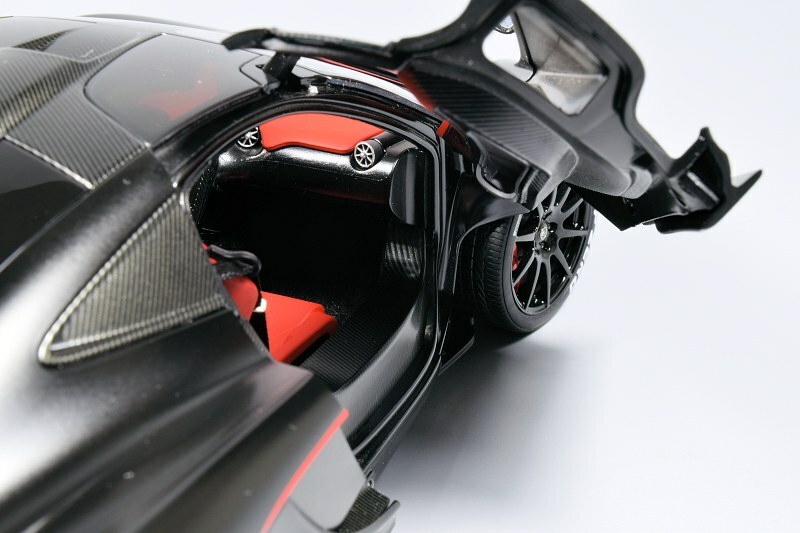 The parts that aren’t covered in the red accents have no carbon fiber whatsoever, and if you look at TSMs take, they actually provide that detail too. Engine is definitely lackluster but doesn’t bother me too much since I would never display the model in a opening position. I bought the model in the same color about a month ago and it’s nice, but definitely not worth the 250 I got it for. Especially not when it’s all one big chunk of plastic. 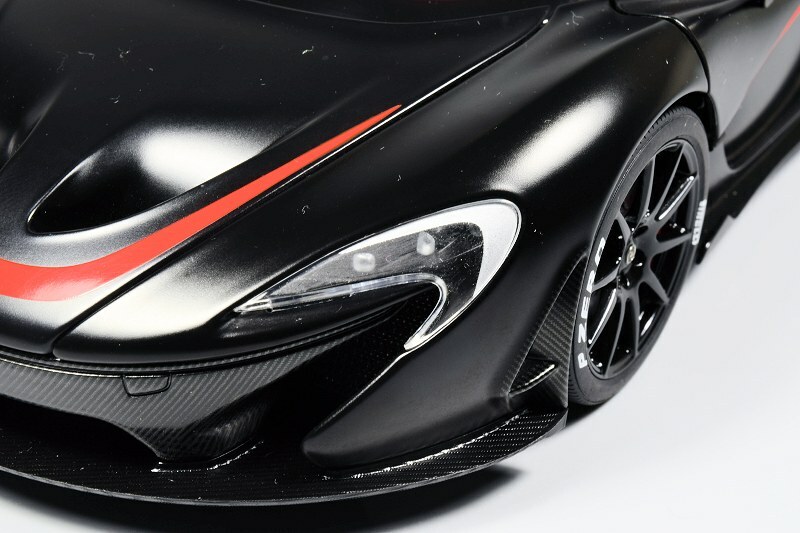 j’ai acheté la Mclaren p1 tsm et autoart , et je vous conseille vivement autoart même si c’est du composite car la p1 tsm a beaucoups de defaut qu on voit pas sur les photo, même si la autoart est plus cher je vous conseille vivement autoart . What a disappointment. AA is becoming very greedy and simply does not deliver anymore. Sad. I got to see this very model that a friend bought and overall its quite good. But I do agree the engine detail is a complete let down.. The rear wing function is good, the wheels and brakes are nicely done too. 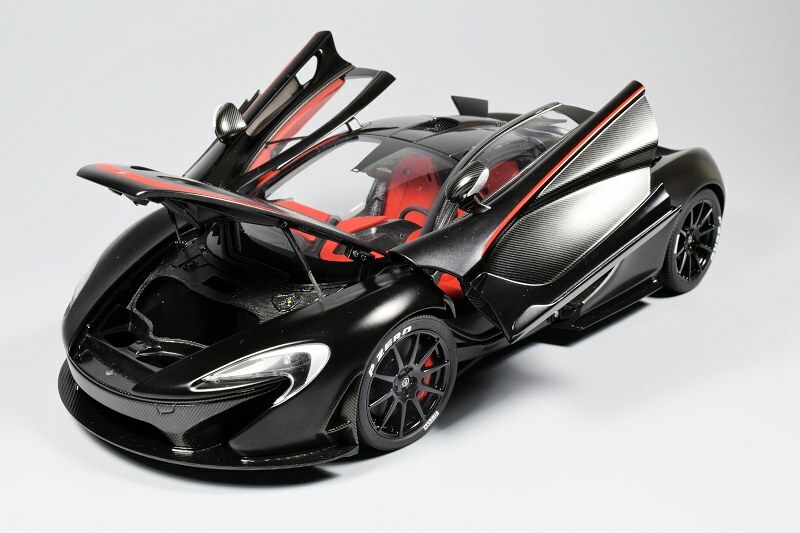 But as with their Aventador models, this P1 definitely does no’t deserve the “signature” status it was given. I usually give models are three category rating and this is how I see it.. Exterior detail gets a 90%, engine detail is 50%, interior detail is 75%. I give this a 215 of a possible 300. In my books, a model must score at least a 250 to be “Signature” worthy. 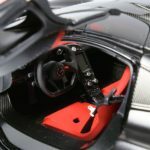 Take the Pagani Zonda R for example.. I gave it a 95% for exterior, 95% for engine and 90% for interior for a 280 total. Would you agree? The 1:1’s engine looks horrid so I don’t care if it’s accessible. 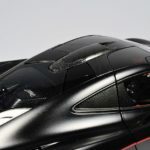 AUTOart also doesn’t offer the Amethyst Black color. I opted to add the first TSM to my collection since it’s diecast and produced in the color I fancy most. AA dominates my collection, but I’ve decided to give their competitors a chance with the current trend in cost cutting and poor detail. AA isn’t greedy, they’re having to deal with high costs of production just like everyone else. 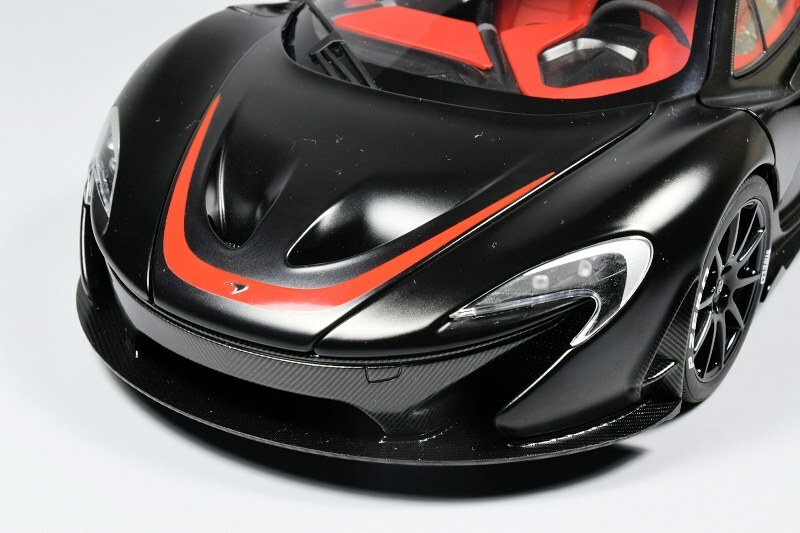 Kyosho seems to be pretty much out of the picture and going down plastic and sealed, same as Minichamps. 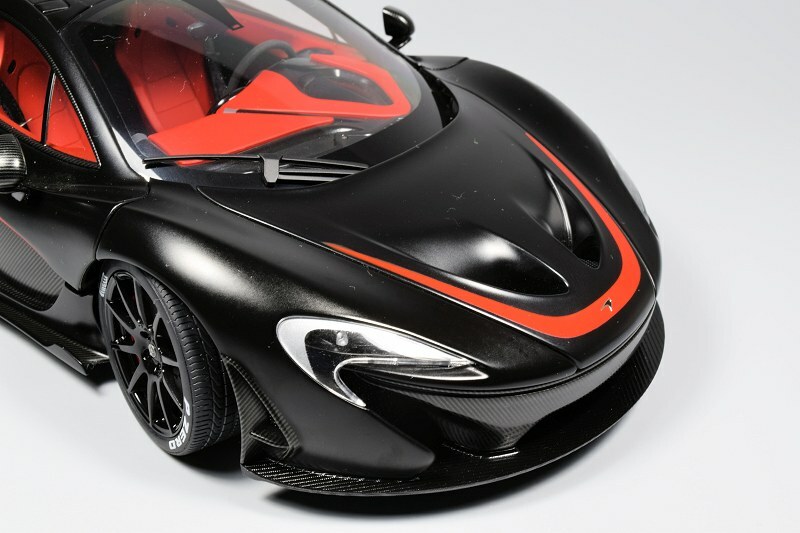 As for TSM, I looked up a few of their McLarens on ebay and they’re all made of resin. 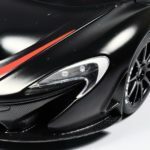 A lot of the new players appear to be plastic too – GT Spirit anyone. You have to be paying megabucks these days for a truely detailed metal diecast and even then plastic seems to creep in… BBR anyone, they’re not all metal.